These pages provide lots of information about your home and tenancy. Our online service for your mobile, tablet and computer is the best way to get in touch. 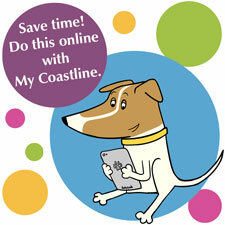 Join free now at the My Coastline page - and head there at any time by clicking the My Coastline link at the top of all our web pages. Here you can report a repair, and find out about Handyline or adaptations. There is also advice about your tenancy and any changes you may be thinking about making to it or your home. For help on moving to another property, including transfers and exchanges, please take a look at our rent a home section.